Why I Love Christian Rock! Christian Rock has always been quite controversial in Christian circles. I have always struggled to understand why. I guess some would say that it is too worldly, that the focus in wrong, but I would whole -heartily disagree. I think Christian rock is amazing, inspirational and powerful, something that I will explain further in this post. I will discuss music from a few bands that I listen too, covering a variety of genres, from rock, to power metal. These include, Skillet, TFK, FireFlight, Theocracy, HB and Decyfer Down. I will use some of their songs to show their message and purpose, and hopefully show that they actually have an important role to play, especially for younger Christians such as myself. Before I go into individual songs, let me explain why I think Christian rock is beneficial. I love rock music, I love the beat, the guitars, the drums, they all make an awesome sound. There is nothing evil in it, and with Christian rock, its all about acknowledging God in our lives, about how great he is and how we can rely on him. God has given us all individual gifts, and thus musicians are also given a gift to play music. The bible tells us to praise God with a variety of instruments, cymbals, strings, etc, and this can be found many times in the OT, most notably psalm 150. God also wants us to be creative, wants us to use our gifts to glorify him, and Christian rock is one way we can do this. Christian rock can have its problems, some bands you may have to be careful about, are they really Christian? Rock shouldn’t really be used as an evangelism tool either, but from what I see it hardly ever is. Its more of a ‘hey guys we’re different’ type of message, whilst giving Christians an encouraging message. So with that being said, let me go into a few songs and what they talk about! Enjoy! When we examine this song, the meaning is clear. It describes about the love of God, the saving power of grace and that God gives us meaning and hope. It talks about us being failures, about being far from God. It talks about the brokenness of the world, but that love is the answer. How wonderful is this song! It has so much meaning, so much power, and is a great encouragement for Christians. TFK (Thousand Foot Krutch) lyrical genius in this song and like all their other songs is evident. For young people especially, songs like this are powerful, at many times, more powerful than hymns because they are relatable. These songs are praise, but at the same time they help us understand more of God. This time we move onto Skillet, probably my favourite band at the moment. The song back from the dead, is a positive feeling rock song. Feelings are important in the Christian faith, and this song to me talks about the Christian coming back to Christ. That the journey is not easy, in fact it’s tough…but nothing can keep us down if we have God. It’s a song that lifts us, and helps us understand that this world cannot keep us down, and that we fight, and struggle for the kingdom. 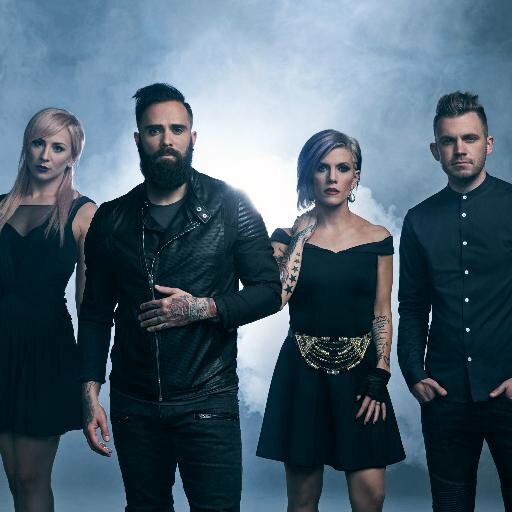 The thing with Skillet is, that their message resonates with both Christians and non-Christians. Their songs aim to help people in difficult situations, being that positive light in the world. They are never ashamed of their faith and speak openly at all their concerts. The witness is strong, they are not going to change to sell for CD’s and the fact they are so popular shows how God is using them! Another song from Skillet, and this one again is a positive rock song. God is always with us, and makes us strong. We cannot be stopped, the word cannot be stopped, and with the strength given from God, we can feel invincible. God is our reason to fight, and we may win or lose, but it is what we are called to, fight for his word, and proclaim the gospel. The song itself is just so catchy, and is great to listen to just for some upbeat Christian music. Regarding the video, you may have noticed, but they have tattoos, they are wearing black, they cannot be Christians. Well if that is your opinion on what makes a Christian, I would be very concerned as to what you are reading. I personally wouldn’t want a tattoo, but he decided to get a few and so be it. Judging someone by their appearance is one of the worst things a Christian can do in my opinion! The final Skillet song could be considered a worship song. Its light rock, its not heavy, and uses mainly electronic sounds. The words are amazing and really hit home for me. What do we have to fear, God has called us through Love, and we are with him. He can calm storms, so he can give us peace. He is never far away and never is late to anything. He holds the stars in place, and he holds our hearts all the same. It is a beautifully poetic song. This song has to be one of my favourites at the moment! Hopefully, you would have seen that Christian Rock can cover a wide range of messages, that show the power, the love of God, but also give encouragement to Christians going through tough times. Sharp, simple messages that reveal the light. Here we have more obvious Christian rock. The song states we are alive in Christ. That we shine in the dark, and that we shouldn’t contain this light. We should go out into the world and spread the news. Fireflight have moved away from traditional rock, into more electronic sounding rock in recent years and it suits them. They have a lot of powerful songs, that range from trials and problems in the Christian life, to songs like this, upbeat and happy, which again give encouragement to Christians. This song is wonderful, I love listening to it, and taking the words in very time. God sees our mistakes, he sees our hearts. We are messed up, even when we try the best we can to do things right. The song talks about this and about that God loves us even though we fail and mess up, that we are his. The song is a dialogue between the singer and God, about how we realises how bad he is, and that he does his best, but knows he ultimately falls short of what God requires of us, yet God responds with love. This song again shows how encouraging rock songs can be for the Christian. Theocracy is an interesting name for a band, you should look up the word! The band however focuses on the genre of power metal and wow do they deliver. Their songs focus on many aspects of God. This song, for example goes through many attributes of God. It is amazing, and well written. Theocracy also cover many aspects of Jesus’s message of how we should be a light in the world, or certain parts of the bible, where Paul finds the altar to the unknown god. In some ways, these are songs you couldn’t write in any other form. The structure of power metal makes it a perfect genre to write about these themes and topics. Again we can see encouragement for Christians, as well a proclamation of what Jesus is all about. Now I don’t advocate entertainment evangelism by any means, but the message in these songs are so powerful, that I think it would be hard to not listen and think about the gospel. Weird title for a song don’t you think? The band is Finish and again are amazing in how they deliver their songs. The singer has a beautiful voice, and this song is actually good. It talks about the truth that Jesus is the only way. No one can get to God without Jesus, and this song covers that point. It declares that we cannot be ashamed of his name and that we belong to him. It’s a call to proclaim his word, and songs like these are what Christians need to hear today. To get out there and make a impact. It reminds of us the simple message of the gospel. Yes they don’t go into the deepness of the doctrines, but I think our focus should go back to the simple points, lest we forget Jesus. So Christian rock, it is quite clear that I am a fan of it. I love rock and metal music. Some of us, *cough* Josh *cough* don’t like the sound of rock music, and that is fair enough, it is not for everyone. However we should not be judging this genre of music. It can be extremely beneficial and useful for Christians and non-Christians alike. As my mother told me recently, Christian Rock artists are musicians who write about their passion, their desires. How great it is to see Christians openly singing about Christ and his love and the cross, how great to see them being so passionate about it. How great it is to see a light in the darkness. Do not judge my dear brothers and sisters, be open minded about this and do not discourage musicians. Now let me go and put some Skillet on, after all they are my favourite band. Author Michael SewellPosted on 14th July 2016 3rd August 2016 Categories Contemporary Issues, MusicTags Encouragement, Rock4 Comments on Why I Love Christian Rock!